Mary: Mormons revere Mary as one of Heavenly Father’s most illustrious daughters, foreordained to be the mother of Christ. Mormons also believe in the virgin birth, which is seen in vision by Nephi in the Book of Mormon. Nephi says Mary was “carried away in the Spirit” and brought forth the Son of God (1 Nephi 11; 2 Nephi 17). Mormons don’t pray to Mary, nor do they believe in the “immaculate conception,” which holds that Mary was sinless. Manifesto: In 1890 Prophet Wilford Woodruff issued an official declaration ending the practice of polygamy. It was the Lord who rescinded the commandment to enter into plural marriage, and Elder Woodruff received a vision to that effect. The Manifesto is included in the Doctrine and Covenants. Mansions: Heaven is divided into three kingdoms, but within each kingdom are many mansions, or levels. Martyrdom of Joseph Smith: Joseph Smith and his brother Hyrum were martyred at the hands of a mob in 1844 in Carthage, Illinois. Joseph foresaw his own death and prepared the Quorum of the Twelve Apostles to carry on, bestowing upon them all the keys of the Priesthood. Melchizedek: The righteous king of the ancient city of Salem. His name is used to identify the Holy Priesthood after the Order of the Son of God, and he conferred that priesthood upon Abraham (Doctrine and Covenants 84:14). In Alma 13:17-18, we learn that Melchizedek’s people were extremely wicked, but they repented under his governance, so Melchizedek was called a prince of peace. Melchizedek Priesthood: The greater of the priesthoods (the lesser priesthood being the Aaronic priesthood.) The Melchizedek priesthood was on the earth from the time of Adam, but was lost during the Great Apostasy. The Melchizedek priesthood is required for many priesthood offices and for many priesthood ordinances, such as administering blessings to the sick and conveying the Gift of the Holy Ghost. Mia Maid: A class in the Young Women’s program for girls ages fourteen and fifteen. The girls are referred to as Mia Maids. The letters MIA stand for Mutual Improvement Association, a previous name for the youth program. Millennium: The one thousand year period in which Jesus Christ will reign over the earth, which will be populated by the righteous. Satan will have no power during this period. This one thousand years of peace will greet an outpouring of the blessings of heaven. Membership in the Church will not be required to survive the destruction of the wicked. All will be taught Christ’s own truth during the millennium, and He will personally oversee missionary work and temple work. Mission Field: Places where missionaries teach the gospel. Sometimes incorrectly used to refer to areas in which Mormons are not largely represented. Missionary: All followers of Christ are to serve as missionaries for the Savior’s Church. However, the term is also used to refer to people with a specific assignment related to missionary work. Young adult men and women often leave home for a period of time (two years for men and eighteen months for women) to serve as full-time missionaries, as do some retired couples. Men often serve as mission presidents, in companionship with their wives. Others may be assigned to serve locally part-time in their own towns. 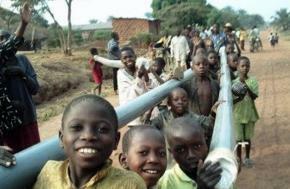 Missionary service includes humanitarian aid missions. Missionary Training Center or MTC: A place missionaries go for a brief time to learn how to work as full-time missionaries. The training may include training in a new language. Upon completion of training, they go to their assigned mission area. Molly Mormon: a cultural term often used to refer to Mormon women who are especially righteous or domestic. The male counterpart is referred to as Peter Priesthood. 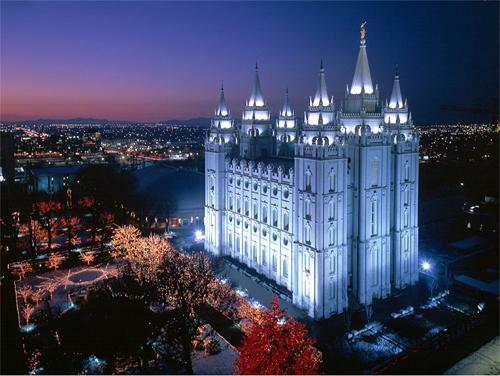 Mormon: Mormon was a prophet who lived in Book of Mormon times. The book is named for him because he gathered the records of the previous prophets into a unified book. Today the term is often used as a nickname for members of The Church of Jesus Christ of Latter-day Saints. Mormon Bible: Some people erroneously assume that Mormons have replaced the Bible with the Book of Mormon. Mormons have several books of scripture: The Holy Bible, the Book of Mormon, the Pearl of Great Price, and the Doctrine and Covenants. English speakers normally use the King James Version of the Bible, which has not been changed by the Church. 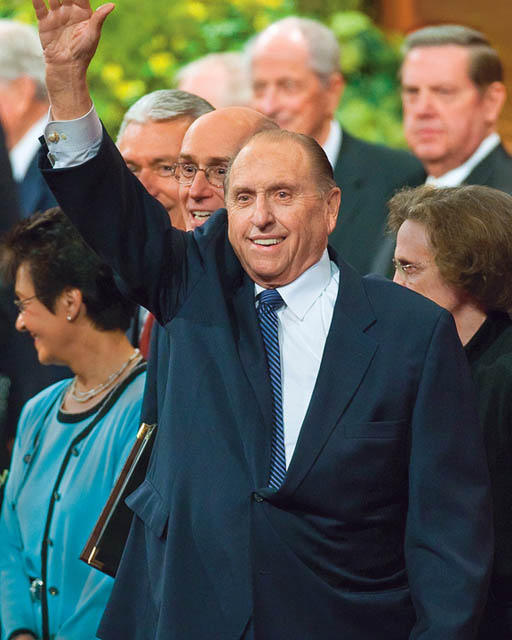 The edition printed by the Church includes footnotes and cross-references to other LDS scripture. Mormon Pioneers: Members of The Church of Jesus Christ of Latter-day Saints who traveled the plains, sometimes pulling their few belongings in handcarts, headed for Utah. This was necessary due to religious persecution and the murder of their leader, Joseph Smith. Mormon Standard Time: A humorous reference to the Mormon tendency to be late for meetings and events. This is generally the result of busy schedules and large families. Mormon Tabernacle Choir: A choir made up of unpaid Mormon singers in Salt Lake City, Utah. They undergo a rigorous audition process and a demanding schedule. Their radio and television program, Music and the Spoken Word, has been broadcast consistently for more than eighty years. They also travel and record. Their music has won many awards. They have performed for world fairs and presidential inaugurations. Moroni: The Book of Mormon contains records of two prophets named Moroni. One is commonly referred to as Captain Moroni. The other was the final prophet of the book. He completed the abridgement of the records kept by previous Book of Mormon prophets and then hid the records in the ground. In the 1800s, he returned to earth as an angel and prepared Joseph Smith to receive the records and bring forth the restoration of the gospel. A statue of Moroni tops most Mormon temples. Mortality: Human life has four stages ─ pre-mortal existence as spirit children of God; mortality; the Spirit World, where spirits reside until resurrection and judgment; and exaltation to a kingdom of heaven as a resurrected being. Mortality is necessary for progression: 1) We gain a body through which to be tested; 2) We learn to discern right from wrong and build character according to our choices; 3) We develop compassion and faith; 4) We establish family relationships. Mother in Heaven: Since God is the literal Father of our spirits, Mormons assume that there must be a mother in heaven also. There is no formal doctrine on the subject. However, the Lord has revealed that the highest level of exaltation is for eternally married couples. Music: Mormons are fully engaged in the enjoyment of and production of music, as can be seen through the talent that comes out of the Church. The Church counsels members to avoid music that is debasing. The hymns of the Church are available online, and you can learn about Mormon musical artists at MormonMusic.org. Mutual: The abbreviated name for the program for teenage Mormons. The full name is Mutual Improvement Association and serves teens ages twelve to seventeen. Mutual activities are held weekly at local chapels. Nephites and Lamanites: Lehi was a prophet in Jerusalem who was led to the Americas before the Babylonian captivity. His righteous son, Nephi, was given the birthright and led a people who called themselves Nephites. The Book of Mormon is a record of their doings. Two of Lehi’s sons, Laman and Lemuel, rebelled against him, and their descendants became known as the Lamanites, who often opposed the Nephites, but were sometimes more righteous. New and Everlasting Covenant: The fullness of the gospel with all of its covenants, including the covenant of eternal marriage. New Era: The name of the official English language church magazine for teenagers. New Jerusalem: During the millennium Christ will rule from two centers, Old Jerusalem and Zion, or New Jerusalem, which will be established in America with its center stake at Independence, Missouri. Jerusalem will be the center for Judah, and New Jerusalem for Ephraim, or the house of Joseph (Ether 13:3-11). Nursery: A class held Sunday mornings for children ages eighteen months to three years of age. The children attend after the regular service (Sacrament Meeting) and have age-appropriate gospel lessons and activities. Obedience: A foundational principle of the gospel, along with the principle of sacrifice. Obedience to the laws and commandments of God has always been a requirement to inherit God’s kingdom. “And [the Lord] gave unto them commandments that they should love and serve him, the only living and true God…” (Doctrine and Covenants 20:19). Offerings: Donations made by church members beyond their tithing. This money goes to fund special programs, such as temple building, humanitarian work, and missionary work. Offerings are confidential; no collection plate is passed, and no public acknowledgment is made for donations. Opening Exercises: The beginning portion of each meeting. Generally includes a song, a prayer, and announcements or business. Ordain: Officially bestowing a priesthood office upon a person. 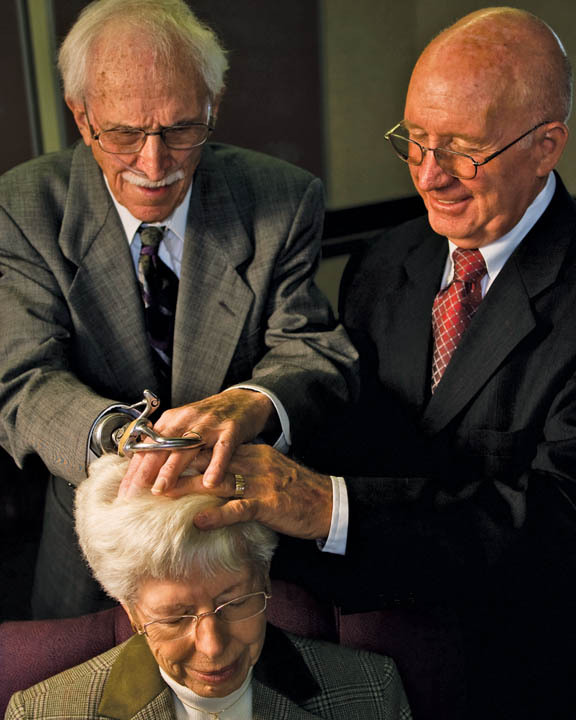 This is done by having qualified priesthood holders place their hands on the head of the person being ordained and administering a prayer that bestows the office on the person. Ordinances: Sacred acts carried out by an authorized priesthood holder and received by worthy members. Ordinances include baptism, receiving the Gift of the Holy Ghost, and marriage. Outer darkness: Also known as Perdition. It is where those who did not earn the right to receive a degree of glory are assigned after death. It is reserved only for those who committed the most serious offense, denying Christ after having received a sure testimony of Him. Outer darkness is the future realm of Satan and his angels, and those who live there are the only people and beings not redeemed by the atonement of Jesus Christ.